This medication is used to treat a variety of skin conditions (e.g., eczema, dermatitis, allergies, rash). Alclometasone reduces the swelling, itching, and redness that can occur in these types of conditions. This medication is a low- to medium-strength corticosteroid. 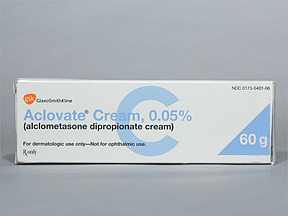 Aclovate Cream is a topical corticosteroid. It works by reducing inflammatory reactions and modifying immune reactions in the body. 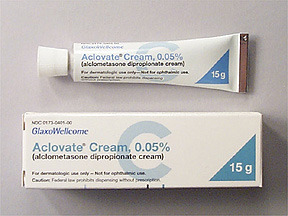 Aclovate is a topical corticosteroid given to treat the rash, itching, inflammation, and other forms of skin disorders including eczema and psoriasis. Drugs like Aclovate do not cure the cause of these problems but they can quickly relieve the symptoms by interfering with the production of various substances in the body that cause these skin disorders. That is why it is imperative that corticosteroids like Aclovate should not be used without prior consultation of your physician, as these conditions could be a symptom of a larger problem. Aclovate is for external use only. Aclovate is a medicine with synthetic steroid medication of the cortisone family and this medicine usually is spread on the skin to relieve certain types of itchy rashes, including psoriasis. Aclovate treats skin problems that are accompanied by itching, redness, and swelling.